We’re still pointing all wagons west, the weird west, every Wednesday. Weird Western Wednesdays are devoted to the wonderful and often wild sub-genre of speculative fiction, weird westerns. 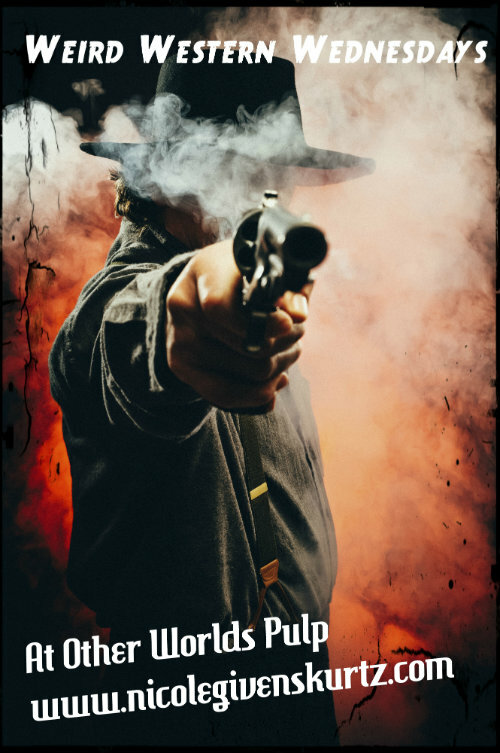 Guest authors will contribute a posts discussing weird westerns. Welcome Misty Massey, brilliant writer, lover of all things weird western, and a great person to Pulp Reports. When I was a kid, I found most westerns boring. Good guys wore perfect white hats and saved the day, bad guys wore black chaps and always got shot. The good Native Americans were weak, the bad ones were strong and they all spoke in broken English. All conflicts revolved around gold, cattle, water or land, and were always resolved with gunfire. For a kid who was always searching for the fantastic in her everyday life, this was just dull. Surely there was something more going on, some sort of strange and unusual power at work under the surface. Then I discovered The Wild, Wild West. 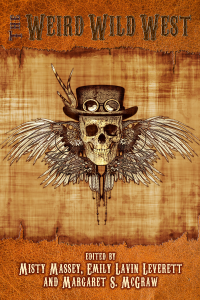 For those of you who are unfortunate enough to not know about this show, it was the original steampunk western, long before the word ‘steampunk’ existed. JamesWest and Artemus Gordon were Secret Service agents assigned only the most unusual cases that threatened the United States. They had their own train, which was comfortable and luxuriously appointed. The train had a laboratory car in which Artemus Gordon could tinker and invent all manner of interesting gadgets he might need to help Jim West out of the eventual situation he always found himself in. A cue stick that could shoot a bullet, a breakaway blow-torch, each piece hidden in each of West’s hollowed-out boot heels, a telegraph mechanism in a cane. Anything they might need, they could invent and carry with them, instead of having to depend on the limited resources of the frontier. Artemus Gordon was a master of disguise, able to become a drunken prospector or a German scientist with the flip of a wig. And I always loved what Gordon wore on his own time – dapper, stylish jackets and hats that would have looked quite at home on a riverboat. When I played with my friends, I always chose to be Artemus Gordon. You know what else was cool about The Wild, Wild West, though? It featured a great deal of diversity for its day. Back in the 60’s, good guys were always white men and they were continually saving weak white women from the nasty Indians. And yes, the heroes of The Wild, Wild West were white, straight men. But women were, time and again, used less as window dressing and more as characters in their own right. They played powerful villains, or brilliant scientists, or even capable assistants, but at least not all the women were saloon girls or schoolteachers. And also unusual for the time, there were all sorts of skin colors represented in the show. Black, Native, Mexican, Chinese…many non-white skin colors that populated the real frontier made an appearance on The Wild Wild West. And despite stories to the contrary, the first scripted interracial kiss was not on Star Trek, but instead happened over two years earlier on The Wild Wild West, when James West and Princess Ching Ling (played by Pilar Seurat, a Filipina actor), shared a white and Asian interracial kiss. These days we can look back and find fault with much of what was happening in those stories. James West was at least as bad as James Bond in his view of all women as sexual conquests, and names like “Princess Ching Ling”, “Bright Star Chief” and “Princess Wanakee” were hideously racist, but for the day, it was darned progressive. Nowadays, we as writers do our best to populate our worlds with all the colors and genders that lived on the American frontier during the historical period we’re playing in, and one of the most important things we can do is remember the mistakes of the past so we never make them again. I hope that someday we live in a world that looks back at our work and sees not only our desire for something magical and lovely hiding under the trail dust of our stories, but also the progress we were making toward a truly blended, global society.